If you follow climate change news, you’ve heard that Antarctica may be thawing more quickly than anyone had thought. But the explanation for why that’s so has left a lot to be desired. WC will undertake to explain why the situation is more dire than had been thought. If we look at a vertical cross-section along that transect, it looks something like this, according to the new data. See that little grey hump right at the red sea level line? If the Antarctic ice retreats behind that little hump all of the Western Antarctic is exposed to infiltration by the comparatively warmer ocean water of the Southern Ocean. Glaciologists know what happens then; you don’t have to look further than the retreat of Columbia Glacier in southcentral Alaska to understand. The ice begins a sudden, rapid retreat. It’s a “tipping point.” The ice melts. And all those bits sticking above the red sea level raise the oceans. How serious is this? Two recent studies focused on four glaciers in the area of the coastal range represented by that bump: Pine Island, Thwaites, Haynes, and Smith/Kohler Glaciers. The Pine Island Glacier came ungrounded in the second half of the past decade, retreating up to 31 km in the process. Although this was the one that made headlines, all the glaciers in the area are in retreat. Thwaites saw areas retreat up to 14 km over the course of the study, Haynes retracted by 10 km, and the Smith/Kohler glaciers retreated by 35 km. What glaciologists have discovered is that the area along that grey bump is the area of fastest ice thinning and retreat in Antarctica. To use glaciological terms, what has historically been cold-based ice, frozen to the sea bottom, is about to become warm-based ice. Cold-based ice is relatively static; warm-based ice moves much faster, sometimes exceeding 1,000 meters per year. Historically, warm-based ice streams have only accounted for about 10% of Antarctica’s area. What the two recent studies have found is that they are poised to become much more. That, based on well-established science, the entire Western Antarctic ice field could be melted in 200 years. That would raise ocean levels world-wide by about 20 feet. Think of it as the southern third of Florida being under water. But wait, the junior Senator from Florida, Senator Marc Rubio (R, Pandering), doesn’t believe in global warming. So that’s okay then. For those of us who are less confused about science and belief – does Senator Rubio believe in gravity? – this is kind of a concern, because it’s really too late to stop. The existing levels of CO2 in the atmosphere effectively assure the melting of the Western Antarctic Ice Field. All we can do is try to stop it from getting worse. What’s that? 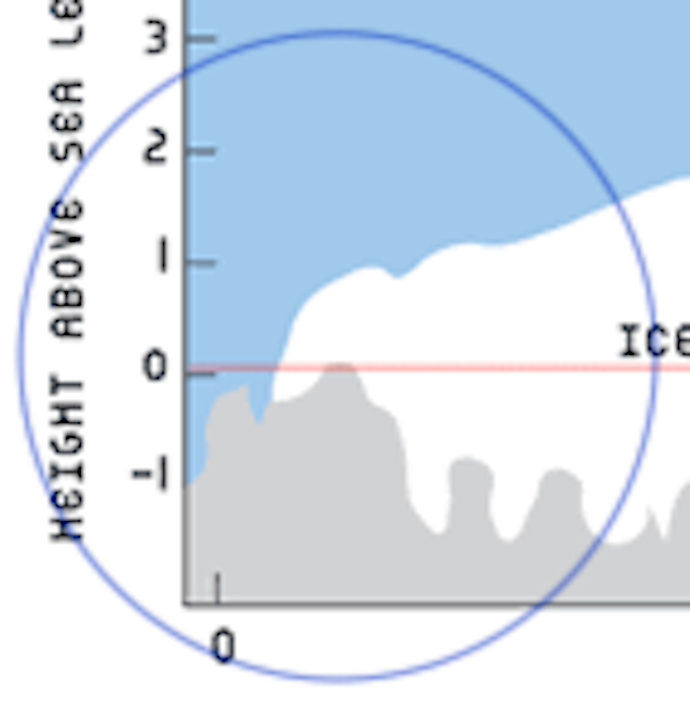 You say it looks like there’s a lot more ice in Eastern Antarctic Ice Field? You’re right. Nine times as much. You ask if it’s going to melt, too? We don’t know; there’s no science. The Eastern Antarctic is much less studied than the Western, partly because it is so much larger and partly because it is harder to get to in the first place. The weather is a lot nastier, too. Besides, the news from the Western Antarctic is bad enough. This was wonderful. Thanks so much for the explanation. I have been struggling to make sense of the reporting on this. Will be visiting Discovering Antarctica. “The West Antarctic ice sheet is doomed. The sheet’s slide into the ocean, and the resulting sharp rise in sea levels, will probably happen slowly. But it’s irreversible. Even if we took drastic action to limit global warming right now, this particular process of environmental change has reached a point of no return.